Behind every great love is a great story. As teenagers, Allie (Rachel McAdams) and Noah (Ryan Gosling) begin a whirlwind courtship that soon blossoms into tender intimacy. The young couple is quickly separated by Allies upper-class parents who insist that Noah isnt right for her. Several years pass, and when they meet again, their passion is rekindled, forcing Allie to choose between her soulmate and class order. This beautiful tale has a particularly special meaning to an older gentleman (James Garner) who regularly reads the timeless love story to his aging companion (Gena Rowlands). 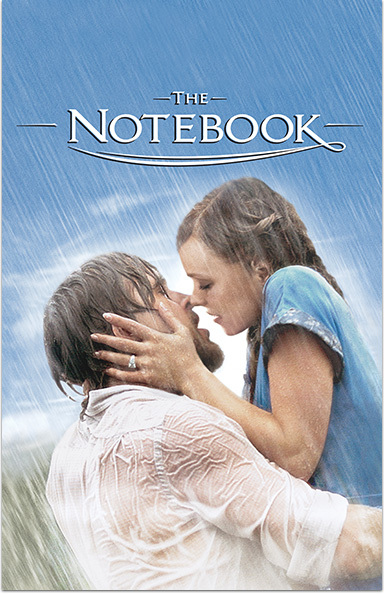 Based on the best-selling novel by Nicholas Sparks, The Notebook is at once heartwarming and heartbreaking and will capture you in its sweeping and emotional force. THE NOTEBOOK Copyright © 2004 New Line Productions, Inc. All Rights Reserved.